DIY plumbing is not always a good idea. Sometimes it takes an expert to know how to proceed. Imagine redoing the tiles in your bathroom for a moment. Everything is going great. You bought all the right tools and resources and you’ve been working at it for a couple of hours. Wait. Something is wrong with the way the tiles are laying. Something is wrong with the type of adhesive you used. What do you do now? Well, unfortunately you might not know what to do. An expert, however would know exactly what to do. Rather than having to come in later and fix anything that has gone wrong, trust in an expert to get it done properly the first time. 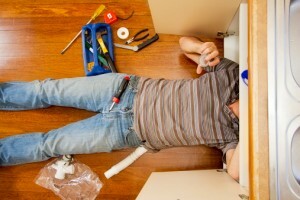 DIY Plumbing repair can make matters much worse. Do you remember the first time you went for a drive? You were nervous and you probably made some mistakes. This is true of every new thing. It takes a bit of time to get used to new experiences and in the meantime, you’re probably going to get yourself into some trouble. A master plumber has a lot of experience and that means that they’re going to be able to tackle not only the task at hand, but any unexpected issues that may arise on the way. This can be especially important when time is working against you such as when there is a leak or a broken pipe. You may think that DIY plumbing will save you money, but the cost of mistakes is simply too high. Is it time to remodel your plumbing fixtures? We can help with that. Looking to replace your toilet? Need plumbing repairs? Give Master Plumbing & Mechanical a call at 301-650-9100 and let our experienced plumbers get the job done right. This entry was posted on Friday, August 12th, 2016 at 8:31 pm. Both comments and pings are currently closed.